The growth of the car works at Cowley meant that between 1921 and 1931 the population of the Headington district rose from 5,477 to 10,131. 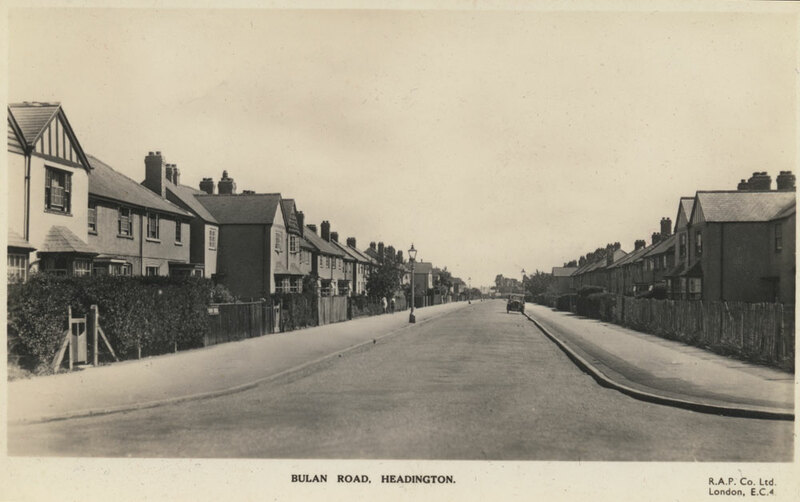 Some council houses were built in Headington in the 1920s and 1930s, but following the Second World War the housing shortage in Oxford was grave, and in 1950 there were 5,000 applicants on the city council housing list. 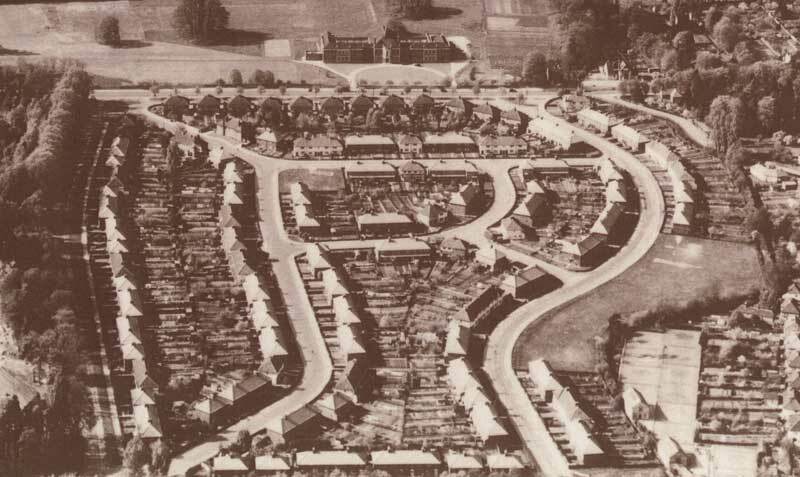 As half of Oxford was already built up and another quarter liable to flood, the farms and market gardens of Headington were an obvious place for council housing. The first council houses in the whole Oxford area were built in Headington in the early 1920s by Messrs Benfield & Loxley of Bulllingdon Road. 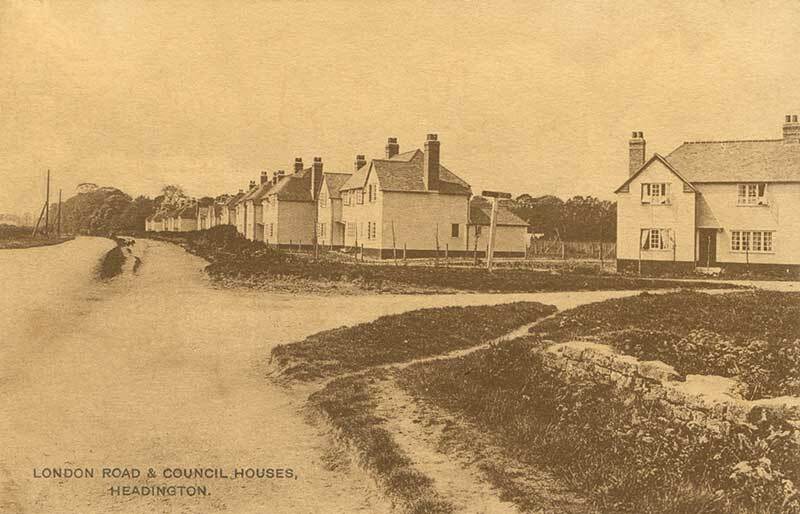 The Oxford Times on 23 July 1920 (p. 13) reported under the heading “Headington Housing Scheme: A rush for tenancies” that 24 houses were complete, and that 60 applications for them had already been made to Headington Rural District Council. It stated that the houses were designed by the architect James Wells of Market Street, and that “the houses erected on the main road preesnt a smart apperance, with their whitewashed fronts and red tiled roofs”. 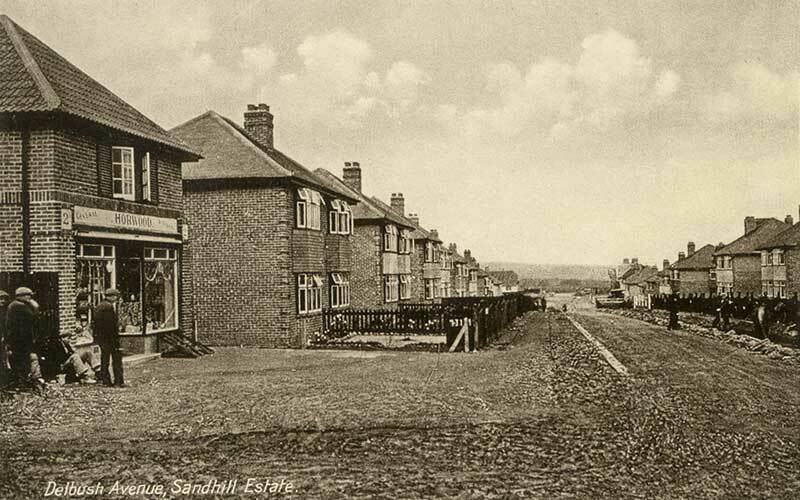 In all, 101 houses were built at the north-east end of the London Road, going around the corner into Barton Road. These houses have always been in the parish of St Andrew’s Church and are not considered part of Barton proper. 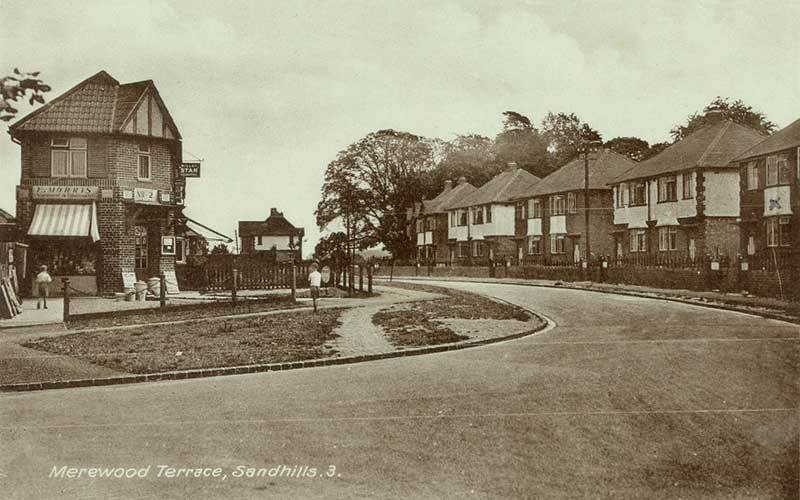 Another view of the Gipsy Lane estate, from the west in 1928. By 1930 this council estate comprised 314 houses. They were built on the old Gipsy Lane itself, and on the following brand new roads: Grays Road, Valentia Road, Cardwell Crescent, Stonor Place, and Harcourt Terrace, all named after local MPs. The estate is in the parish of All Saints Church. Before 1946, Barton was an ancient hamlet of Old Headington, comprised mainly of the present Barton Village Road. In that year its development as a council housing estate began. In 1949 Barton Junior Mixed School opened in Northway, and in 1952 Barton Infant School opened in Fettiplace Road: later school changes are listed here. 14: Michael’s (R. & E. J. Wells), newsagents. Barton was originally part of St Andrew’s parish, but in 1958 St Mary’s Church opened, and its parish comprises the whole of Barton. Although in 1956 Oxford became the first city outside London to adopt a green belt, new houses continued to be built in Barton, and by 1977 there were 1,600 council houses there. The building of 570 council houses in Northway started in 1951/2, and included Plowman Tower, Oxford’s first multi-storey block. Northway is in the parish of St Andrew’s Church. 61: R. A. Harmsworth, newsagent. In May 1951 planning application 51/01745/A1_H was approved for 116 Easiform houses in sites in Pauling Road, Palmer Road, Titup Hall Drive, Wood Farm Road, and Masons Road (18–48 even and 1–51 odd nos) on some of the land of Wood Farm. The first 510 council houses of Wood Farm were built from 1953 onwards. The much-reduced farm continued to operate until the mid-1960s: it was owned by R. C. White until 1964 and was known as White’s Farm. This aerial view shows the first houses being built in 1953. 21: Mrs F. H. Hulme, confectioner and tobacconist. Wood Farm Junior Mixed and Infant School opened in Titup Hall Drive in 1956, and the Slade Nursery transferred from the Slade to Wood Farm School in 1983. In January 1961 the first application for Forester’s Tower was approved, but this was changed in planning application 65/10079/A_H of 1965 to a 15-storey block of flats containing 57 two bedroom flats, 28 one bedroom flats, and 62 stores. This permission was conditional on the erection of an adequate number of garages for use by occupants of the proposed flats (to be constructed and brought into use at the same time as the flats), and in May 1966 planning application 66/17606/E_H for these garages and the street layout was approved. In 1968 outline planning application was granted for further development to the south and in November 1973 the full application 73/01537/A_H was granted for: “Phase 1 residential development for 54 houses, 48 flats and 3 bungalows for disabled persons” in Atkyns Road (2–10 even nos); Leiden Road (1–-67 odd and 2–102 even nos); and Holland Place. Wood Farm is in the parish of Holy Trinity Church in Quarry. Slade Park was originally a wartime development of temporary housing split up into nine avenues. In July 1950, planning application 50/01232/A_H was approved for “Erection of 20 pairs Hawksley aluminium bungalows at The Slade Park”, with the address is given as Wood Farm Estate, The Slade. The temporary housing was not pulled down until 1961. Since about 1974, 320 new houses have been built on Slade Park. 260 coumcil houses were built here from 1958. The estate is in the Parish of Holy Trinity Church in Quarry. Planning application 54/04057/A_H for “Land at Town Furze – Layout of housing estate” was approved in November 1954, comprising Girdlestone Road (1–57 odd and 2–62 even). 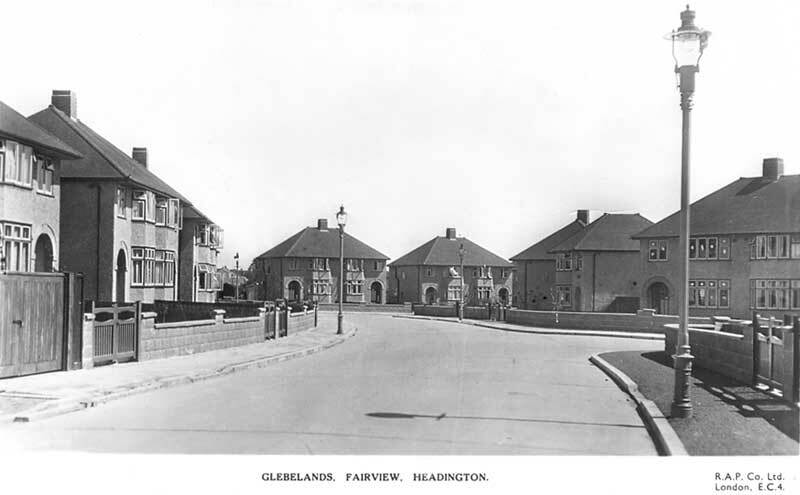 Another application for 159 “Easiform” houses and 84 flats at Town Furze 55/04177/A_H (which included the 60 Girdlestone Road houses) was approved in January 1955. This included Atwell Place, Dynham Place, Flexney Place, Goslyn Close, Heath Close, Massey Close, Warren Crescent, and Wylie Close. 150 council houses were built on site of the former London Road workhouse, which since 1931 had been a hospital known as The Laurels. It is in the parish of Holy Trinity Church in Quarry. An outline planning application for the west side of “The Laurels” was agreed in May 1955, and full application 57/06175/A_H was approved in July 1957 for “Housing and ancillary purposes involving diversion of existing footpath”. This area comprised the site of 41–51 Gladstone Road (odd numbers); of 240–246 London Road (even numbers); and of William Kimber Crescent (1–11 odd and 21–12 and 16–20 even). In December 1957 revised application 57/06431/A_H was agreed for the same site for 29 houses and six lock-up garages for private cars. Twelve more semi-detached council houses were built at 6–19 Toot Hill Butts when permission 59/08718/A_H was granted in December 1959. In May 1968 an outline application for The Laurels was agreed, comprising “residential development including shops and garages with roads and footpaths, and the closure to vehicular traffic of the junction of Pitts Road and London Road”: the new buildings and roads planned were Douglas Veale House; Gladstone Road (even nos. 48–74), Tilehurst Close, Trafford Road, John Snow Place, and Colemans Hill. The full application 69/20161/A_H was approved in August 1969 for the erection of 6 five-bedroom houses, 10 four-bedroom houses, 23 three-bedroom houses, 28 three-bedroom houses, 3 three-bedroom bungalows, 4 one-bedroom flats for old people, 1 two-bedroom flat, 1 shop on ground floor, and 17 garages and hardstanding. Five more council houses were built in Spooner Close when permission 75/00748/A1_H was granted in September 1975. Twenty-three council houses (designed by the City Architect’s Office/David Williams) were built on a nursery garden in Old Headington that was the last remnant of Laurel Farm. Outline planning permission was granted in 1974, and final planning permission 83/00565/GFH in December 1983 for “20 houses with on plot parking, 3 elderly persons bungalows, block of 4 garages for rental to local residents, 3 elderly persons’ bungalow and associated site works”. In November 1984 planning permission 84/00629/GFH was granted for “Erection of 26 one-bed flats, 1 two-bed flat, 1 two-bed disabled persons flat, 1 two-bed disabled persons bungalow. Car parking and new vehicular and pedestrian access. Located north of Bury Knowle Coach House”. The buildings were designed by the City Architect’s Office/David Williams. Morrell Avenue is actually part of St Clement’s parish, but leads up to Headington. Its 219 houses were built on the south side of South Park in 1929–31 and are of a higher standard than most council housing, probably because they were built at a time of high government subsidies. The city council had hoped to build on all the farmland on the south side of Headington Hill that had belonged to the Morrell family, but the Morrell Trustees would only release this strip to the south, and the Morrell Trustees sold the remaining 60 acres to the Oxford Preservation Trust with the stipulation that no building should ever be erected on it, and this is now South Park. This area is on the borderline between Cowley and Headington, and although its postal address is Headington, it is in the parish of St James’s in Cowley. Bulan Road and Dene Road were named after the area of land at the foot of Shotover called Bulandene Green (later corrupted to Bullingdon). This aerial view shows the Bulan Road estate in 1928 when it was very new. Dene Road, facing the Slade, with Bulan Road running off to the right in the distance. In 1938 Glebelands (with 56 houses) and Town Furze (with 29) were also built up, and a start had been made on Lye Valley. By 1943 Lye Valley had 33 houses, and the following new road were also built up: Peat Moors (with 46 houses), Inott Furze (17), and Fairview Road (16). By 1960 a beer retailer (later the Fairview Inn) had opened at 16 Glebelands. The houses in Lye Valley and Glebelands (below) are larger, and were private homes. This estate grew up in the 1930s.